Eloise Passarella, a first-year medical student, has combined her two passions of medicine and dance to create a calendar featuring medical students representing various styles of dance in medical-related environments. All profits from sales of the calendar will be donated to the National Centre for Dance Therapy of les Grands Ballets Canadiens. Growing up in France, Eloise Passarella began dancing at the age of six. She eventually worked her way up to take classes at the Conservatoire de Paris. Following a brief break – and a move to Montreal – Passarella enrolled in the danse-études pre-professional program in high school at the Collège de Montréal, attending classes in the morning and then dancing for three hours each afternoon at Ballet Divertimento. 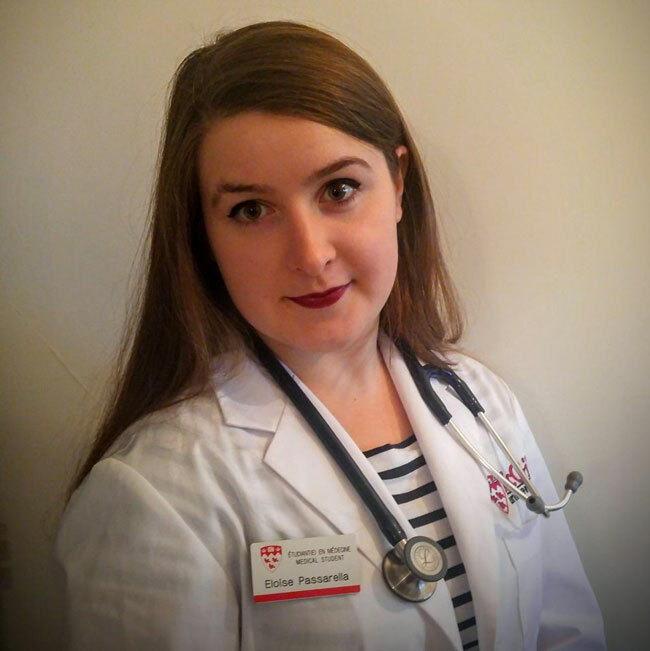 First-year medical student Eloise Passarella. During the same period, Passarella became fascinated by dissections in high school and then while in the health sciences program at Dawson College. As someone always searching for ways to answer questions she had, she was intrigued by the manner in which pathology helps to get to the truth in diagnoses, and decided she wanted to pursue a career in forensic medicine. Now a first-year medical student at McGill, Passarella has continued to dance four times per week and had been trying to come up with an idea that would combine her two passions. 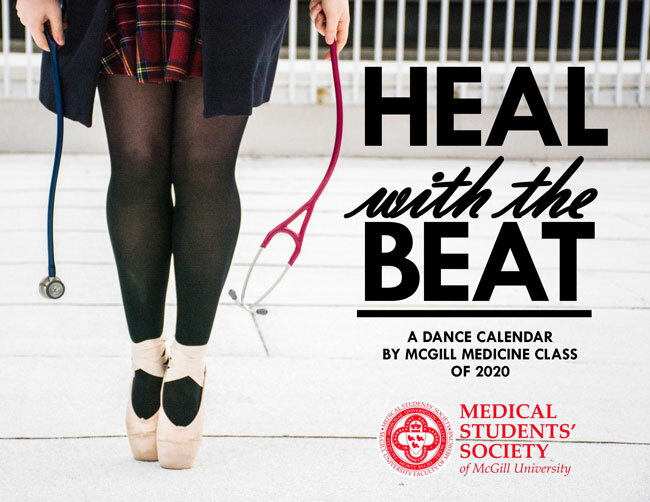 “For a while I had this idea to combine my two greatest passions, dance and medicine,” says Passarella, “both in terms of the beneficiaries of an initiative and in the process of creating it.” The initiative to which she refers is the production of a calendar featuring Eloise and a collection of her fellow McGill medical students who also had previous dance training. Dance therapy has ties to medicine in other ways as well. For example, it was a theme of one of the workshops at the Simnovate Summit hosted by McGill’s Steinberg Centre for Simulation and Interactive Learning in May 2016. Dr. Rajesh Aggarwal, Director of the Simulation Centre also sits on the board of Les Grands Ballets Canadiens. Calendars are available for $15 each ($12 for students). Those interested in purchasing copies can do so by contacting Passarella at eloise.passarella@mail.mcgill.ca and arranging for payment by e-transfer, cash or cheque. She will be delivering the calendars to various locations across the McGill campus, at the McGill University Health Centre’s Glen site and at the Steinberg Centre for Simulation and Interactive Learning.